The digital customer is becoming more and more important to your business. The digital customer continues to evolve. How they shop and how they use the internet should be of great interest to you. Just having a website isn’t enough. Your RV Advertising needs to evolve with the shopping habits of today’s consumers. If you need more insight and marketing ideas give me a call. A good marketing program needs to incorporate traditional advertising, digital and social media. Just remember market share is up for grabs. Inject social media into traditional advertising. Although digital marketing might not be as old as television and radio it gives you a great opportunity to reach out to your customers. Creating a newsletter using your Blog content will connect with your database. These three examples are taken from a Social.Motive sldie show. They demonstrate regardless the size of your database you can expect some great results. Each of these newsletters would cost $500 to $ 1,000 if created from scratch. In a good social media program they are just an added benefit. Open rate in these three examples ranged from 18% to 32%. You really should be doing this once a month if you want to effectively own your customers and grow your market share. This is great ROI! If your RV Advertising agency or staff is not prepared execute give us a call. We can get you on track in a very short time. You know by now that emailing to your customer base is one of the best ROI activities you can put into your monthly marketing plan. You also know how to buy targeted lists for direct mail. It’s true GM’s and Dealers are learning that you can now filter email lists in your market with the same filters used in direct mail. The filters are endless eg. age, income or credit scores even RV Owners and enthusiasts. So if you’re wanting to drive traffic to your dealership but have worn out direct mail try video email as a new marketing tool. In fact, if you run the numbers, the cost comparison is a little scary. Lets say you want a simple list of RV Owners in your market area. You have a budget of $3800 for your direct mail piece. Your completed piece costs 76 cents a piece mailed first class. For this price you’ll get around 5000 pieces. For the same $3800 you maybe shocked with how much you get with video email. First, you’ll get a list of RV Owners. Second, you’ll get 20,000 emails mailed out twice. Thats a total of 40,000 emails sent to RV Owners in your market area. Next, you’ll get a custom email piece with a custom landing page for the offer. 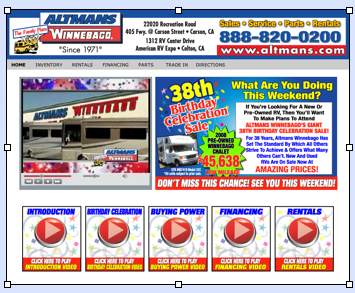 When your prospect hits the landing page you’ll have a variety of short videos selling your offers and your dealership. This intrusive use of video is a strong dealership traffic builder. You put the use of audio and video into the equation. These two powerful tools will influence one’s behavior at a greater rate than standard text. The fun you can have with your message is up to you and your RV Advertising Agency. 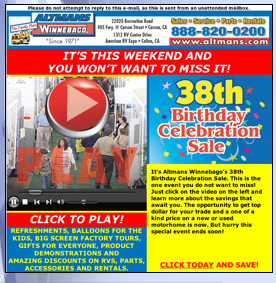 So as you plan events in the coming months consider using conquest email marketing. The numbers are in your favor. Social media reinforces the art of relationship selling. The RV market responds as well as any to relationship selling and social media is simply “relationship selling on steroids”. I owe Mack Collier, author of the blog, The Viral Garden, for the inspiration for this post. He provides some straight talk regarding the lack of growth to individual and company online communities. Many dealership and RV Advertising agencies struggle with building an online community. I’ve discovered a number of them that have the attitude “if I build it, they will come” but that isn’t the case. There is a lot of work involved to generate traffic to an online community. Many dealerships are anxious to sell. Generating income for their dealership is first and foremost in their minds before paying their dues and earning their way with social media. We are in a business where relationships are important. People want to do business with people they know, like and trust. I’m a strong advocate that a dealership can build and sustain a pipeline of new business leads for their business through social media, but it must be done the right way, with the right motive and with genuine transparency to be effective. Be a friend first. 2. A lack of value/benefit to your audience. Your audience will let you know if your content is beneficial and of value to them. You can’t blame your audience if they don’t respond! It’s your responsibility to figure out what is appealing and what isn’t. You have plenty of tools in social media to provide you the information just use them! You will need to dig deeper to figure out how you can best be of value and benefit to them. It’s not about you or your dealership it’s about them. Your blog has to be well optimized for my target audience. Search should be a distant third in generating traffic to your blog site. First should be generating most traffic from by repurposing your blog posts through Twitter. Secondly, I generate traffic with a monthly email newsletter and an opt-in strategy for sign-ups. The point is, don’t sit around waiting to generate traffic to your blog through search. Be proactive in reaching out into a number of online communities that target your audience. 4. Lack of appreciation for those that are helping promote you. There are scores of people that are willing to be of help to you online but they’ll be quickly turned off if you don’t show appreciation. Your dealership’s credibility rests upon what others are saying about you. Be sure to show your love to those who go out of their way to promote your company. Always be willing to reciprocate. 5. You could care less about the prospective audience you are trying to reach. If all you want out of social media is to make money, then social media is not for you. Don’t waste your time and effort. But, if you are willing to be transparent, open, honest and caring then social media can teach your dealership how to do new business development the right way. The way we should have been doing it all along. Don’t think social media is going to replace email because it won’t. Email will remain an important tool for your dealership to effectively market in this growing digital world. The rise in popularity of social media only enhances email. The two together can be powerful. Two excellent articles, Chris Crums, writer for WebPro News, “10 Reasons Social Media isn’t Replacing Email” and VerticalResponse CEO Janine Popick, “10 More Reasons Why Social Media Wont Replace Email.” Chris always has great marketing insights. Janine also provides some insightful resources and practices what she preaches for both email marketing and social media. I recommend them both. Your customers still send handwritten letters and cards. Email registration is needed to do almost anything on the web. Email quickly notifies you of updates from your social networks. 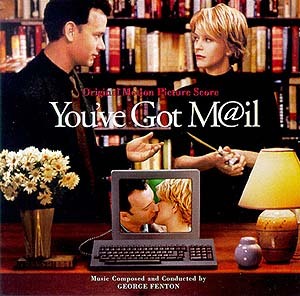 Email is universal and social networks are not. Social networks aren’t for everyone. Even social networks themselves recognize the importance of email. 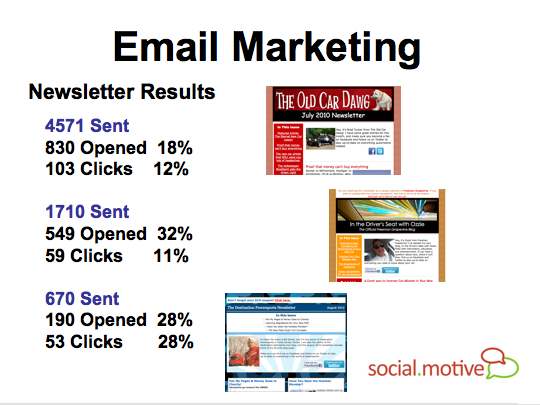 More social media use means more email use. As far as marketing is concerned, email is prompt and cost efficient. Twitter and Facebook are fantastic products and companies; but that’s what they are, companies. You can’t tell who clicked on a link with some social media outlets. You are limited to 140 characters in Twitter. Most of us have more to say. You almost have to have separate social media accounts for your business and your personal life. Email is a great transition point for your customers and prospects to connect with your social platform. The rise in popularity of social media will only enhances email. It’s not an either or scenario. Let your marketing mind figure out best the two can work together to drive more dealership traffic. Let me know what your thoughts are on email. Has it worked for you?